Each offseason, the league’s competition committee looks at a series of rule-change proposals and votes on which rule changes to enact in the following season. One such proposal, up for review this week, could limit all defensive pass interference penalties from a spot foul to a maximum of only 15 yards. Several months ago, Matthew Berry, who I’d honestly be fine with acting as our industry’s own personal competition committee, polled his followers asking whether or not they thought pass interference yards should be included as actual yards in fantasy scoring. I voted yes on this poll, but “Hell no” eventually won the majority by 16 percent. In the case of the NFL, I’m strongly against this rule change, and luckily, it’s not expected to pass. When asked about his opinion on the subject, Dolphins head coach Adam Gase said, “If I was on defense I’d be excited about it. I’d tell [my defender], anytime you’re beat, just tackle the guy.” I think this does a good job of speaking to my issues with this potential rule change – it rewards defenses for bad pass coverage and disincentivizes defenders to play an open receiver honestly on deep passes. Beyond this, it could have a significant impact on fantasy scoring, limiting deep passes as a whole, and hurting, specifically, the league’s best deep-ball wide receivers. 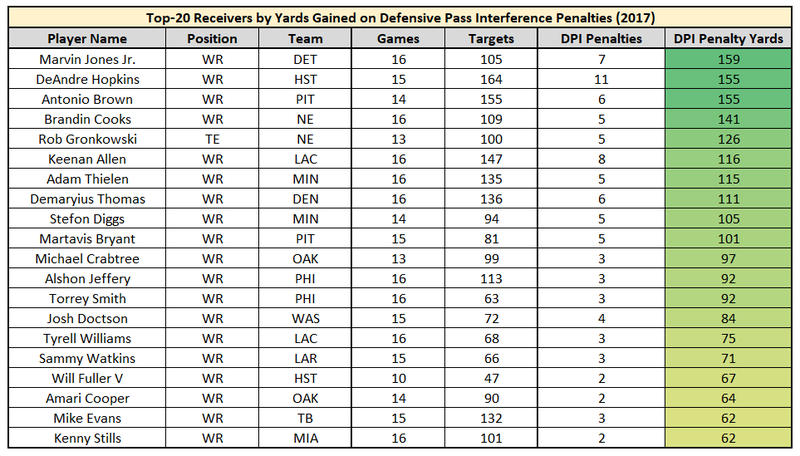 In this article, I wanted to spend some time looking at the receivers who most frequently drew pass interference calls to see who might be most negatively impacted by the rule change, as well as who might benefit the most if your fantasy league started awarding points for defensive pass interference yards. DeAndre Hopkins drew the most defensive pass interference calls among all receivers with 11, or three more than the next-closest receiver (Keenan Allen). Marvin Jones Jr. led all receivers in defensive pass interference yards with 159, but Hopkins and Antonio Brown were only four yards behind despite playing in fewer games. Jones also led all receivers in DPI yards gained as a percentage of raw targets, followed by speedsters Torrey Smith, Will Fuller, and Brandin Cooks. Rob Gronkowski drew 126 DPI yards in 2017, or 78 more than the next-closest tight end (Austin Seferian-Jenkins). Absurdly, he accounted for 23.4 percent of all DPI yards drawn by a tight end, on only 2.9 percent of all tight end targets. From a fantasy perspective, I don’t think the rule-change would be significant enough to make any changes to my rankings, but I could see it shaving a few points off of a player’s overall projections. For instance, this rule-change would slightly reduce Cooks’ value to his team as one of the league’s top deep threats. Intuitively, fewer yards overall means the rule change might result in fewer deep targets for Cooks, or, more likely, just fewer actual yards and more illegal contact and DPI calls. However, a player like Hopkins or Allen could actually gain a (negligibly) few points in my projections. Both actually would have gained DPI yards with the rule-change, and this could mean less illegal contact on targets closer to the line of scrimmage. On this chart, mostly, it’s exactly who you’d expect to make the list – a combination of the league’s best route runners and the league’s elite speedsters and primary deep threats. 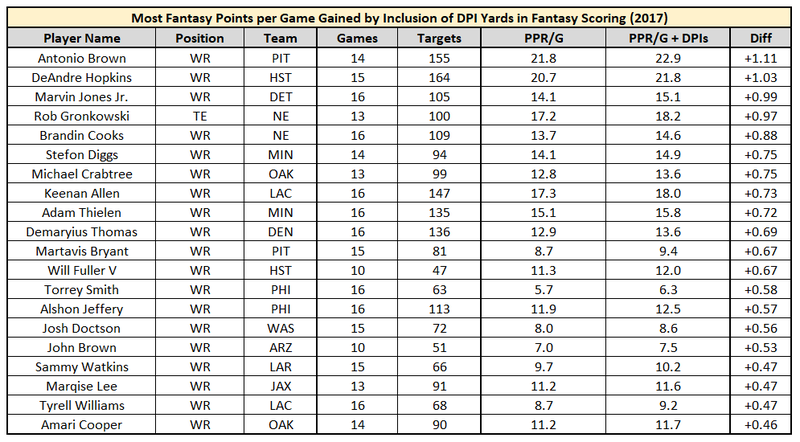 Personally, I’d love if fantasy leagues started including DPI yards in fantasy scoring. It would be hard to enact, but it would award a player for something that actually helps his team and seems fairly highly correlated to an actual skill.